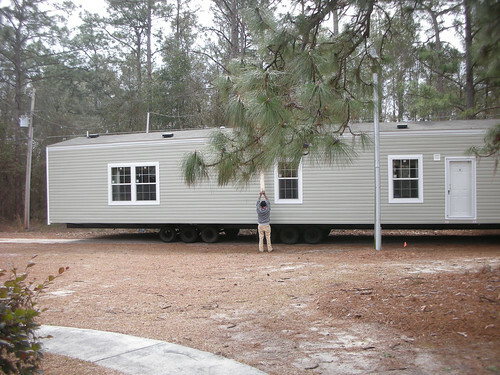 Mobile homes are generally these pre-fab homes you see being transported on the highway. I don’t ever usually write about investments, admittedly because my knowledge in the area is limited. But when I heard about this one the other day on NPR, it was so interesting I just couldn’t help myself. I’m not advising that you invest in this non-profit, again, because I have no right or authority to do so. I’m not telling you NOT to invest in it. If you have any input on investing in real estate ventures or non-profits, I’d love to hear it. Social entrepreneurship differs from the entrepreneurship we are all so used to in that the reason the entrepreneur implements business strategies is not for personal financial profit, but rather to solve a social problem. President Paul Bradley of ROC USA has done just that. You can own a mobile home. In fact, most people who live in mobile homes do. But most people who own mobile homes do NOT own the land that their home sits on. They pay a mortgage and rent, making it extremely difficult to get by, nonetheless ahead. If the rent’s so high, why don’t they just move their home? Because the name is misleading. “Mobile” homes are not mobile. When a mobile home park owner puts their land up for sale, ROC USA steps in and helps the residents of that park form a co-op, purchasing the land beneath their feet at a competitive bid. Now the people who were once struggling to get by can sell their home and their share of the land it sits on for a profit if they so desire. Today, many donations are made to ROC USA by large organizations, but Bradley would like to see more private investors. Let’s face it: trailer park residents don’t get the best rap. I’m not going to get into all the stereotypes you are surely all-too familiar with. But maybe ownership of their own land could change this. It already has for the residents ROC USA has helped. Maybe these people ended up in the situation they’re in because they weren’t lucky enough to have bigger opportunities. Maybe they simply made a bad investment choice when they were purchasing their home. If giving people a second chance doesn’t sit well with you where your money’s concerned, consider this: not a single dollar lent has been lost on ROC USA, or previous community organization efforts that preceded the non-profit. This entry was posted in Money Management on May 14, 2012 by femmefrugality. I think this is a great idea. I wish we had organizations like ROC where we live. There are a lot of people who could really use the support. Really interesting post! I have never heard of this, but I did know that mobile home owners don’t own the land they live on. I actually thought their homes were pretty mobile though. I’ll check this out though, thanks for posting! This is a great idea. I wonder if ROC USA has been around for awhile, because I’ve never heard of it. I hope that there have been a lot of mobile home park owner who have sold their land over the years, so that new mobile homeowners can take advantage of this benefit rather having to wait for mobile homeowners to put their land up for sale. I think they’ve been around since 2006. That is a really great for ROC to be helping all of these people. I hadn’t previously heard of this, but it sounds like a very worthy investment. what a great example of helping others! thanks for this post. awesome insight. when i worked at a civil engineering firm, we had this sad project where the owner of the land was putting all of the mobile home owners off their property to excavate it into a shopping center. It was so sad! But I can see how they can be beneficial for an investment vs renting.